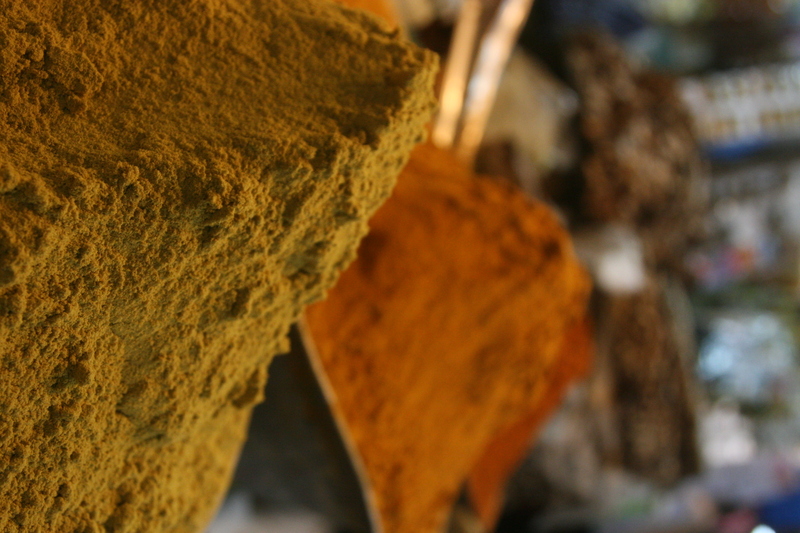 Walking through indian markets, the colors and smells of the local spices will most likely be the first thing that pops up. Being of indian heritage and having traveled to India many times, I was extremely excited to be part of the Auroville Practicum this year. Besides capturing instants with my camera, one of the major attractions of my travels is also tasting local foods. As soon as we reached Auroville, I realized that we would be eating in restaurants at least twice a day. I was going to make the best out of this opportunity and my appetite never wained during the course of the month there. The first week was spent acclimatizing ourselves with the surroundings and visiting sites of Aurovillian units that we would potentially be interested in working for. Along the way, we also took the opportunity to try as many restaurants as possible. 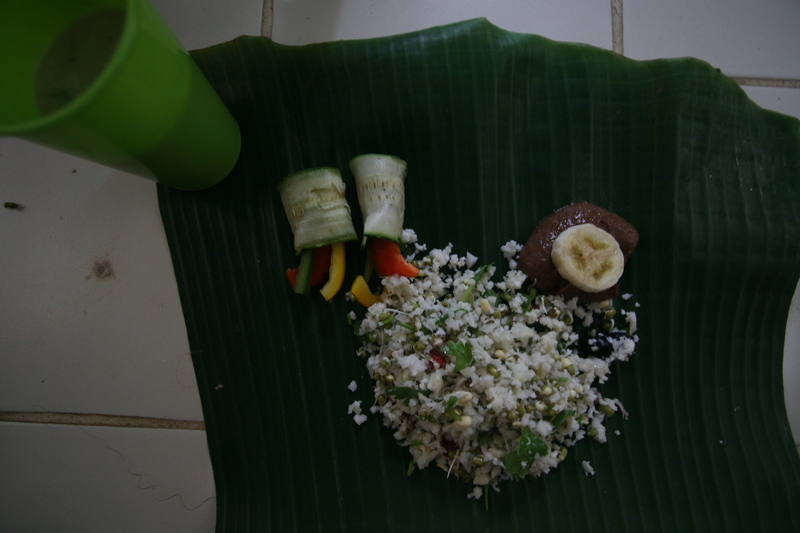 One of our first encounters with local food was at the Mohanaman Centre. The centre is devoted to offering space for children to play sports and engage in cultural activities. The manager there invited us to a typical south indian lunch. All 21 of us sat around the huge casseroles of prepared daals, rice, papads and vegetables eagerly waiting to be served on our individual banana leaves. This was the first time (during this trip at least) the students were faced with the situation of having food in front of them and no utensils. That did not bother us, as we delved into the dish wiping it clean and licking our fingers full or rice and daal. 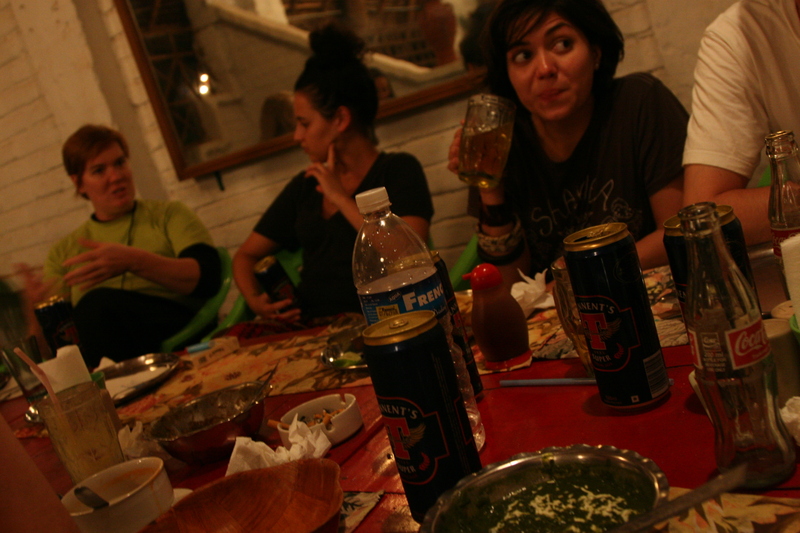 During the first week we continued to indulge into the southern indian flavors. We ate thalis filled with raita, sambar (southern lentils), subji (assorted vegetables) and many delicious pickles and chutneys to spice up the palate. Charles trying his hand at a vegetarian thali, Pondicherry. 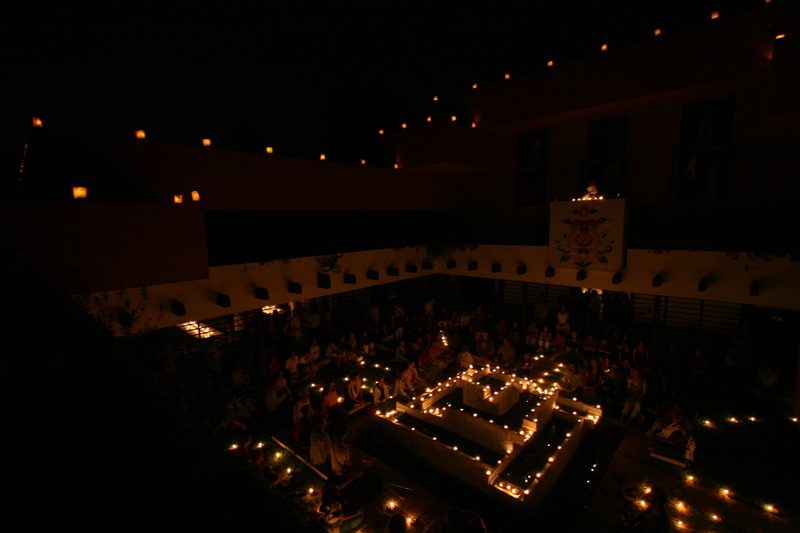 As you may be aware of by now, Auroville is a vibrant international community. The international aspect of this town fully reflects in the area’s gastronomy. Auroville’s strive towards becoming fully organic offers the community a variety of diverse, clean, fresh and tasty vegetables. Most restaurants offer a fully organic cuisine using vegetables and fruits farmed locally. Auroville being international as it is, offers french cuisine at the Town Hall, organic vegetarian mediterranean (and indian) food at La Terrace, italian food at New Creation and north indian food at Hindus Valley, the Visitors’ Centre, Solar Kitchen, Roma’s and israeli and greek food at Well Café. We spent the majority of our time alternating between these restaurants. Hindus Valley offers typical north indian food, serving chapatis with subji and daal for lunch everyday. The restaurant is based on the gift economy model, meaning people contribute what they can towards the bill. The Town Hall, right next to the financial services office, offers a mix of indian and french food. The french owner is proud to propose different french dishes everyday and it is one of the nicest terrace of Auroville with a great view of the Matrimandir. The Terrace is one of my favorites. Owned by a Spaniard Marc, it offers a mix of western organic delights. The palak pasta remains one of the best dishes I ate in Auroville. Right under La Terrace is the Solar Kitchen. This restaurant has a cantine feel to it as many Aurovillians go in and out for a cheap lunch. You go through the line, fill your plate with the chapatis, daals and raita, take your lemon water and eat in a very crowded, noisy, yet familial atmosphere. Veggie Lasagna and Sandwich at La Terrace. Auroville is full of surprises. Although very far from Italy, I ate some of the best pizza in my life here in Auroville at New Creation. Ironically, the restaurant is run by a group of frenchmen, but rest assured the chef is fully Italian. There, you can find vegetarian, vegan and sea food pizzas as well as all sorts of traditional and authentic italian pastas. I highly recommend the “unfolded calzone”, otherwise known as… a pizza. One of the most interesting assets of this restaurants is its long outdoor terrace giving it a very summer-like feel, especially when the chef theatrically speaks in italian during his breaks. The Visitors’ Centre was often our go-to for a quick indian meal. Situated right next door to the American and Tibetan Pavilions, we got to know the place so well that some of us no longer looked at the menu before ordering. Not all restaurants were fully organic and healthy however. Many of us liked to sit at the Ritchy Rich café and indulge in a ice cream coffee full of creamy ice cream and a hefty dose of caffeine. We also stumbled across a restaurant called Beach Café on the border of Auroville, just outside the town. This meant the Beach Café was not imposed the alcohol restrictions of Auroville and that you were sure to find someone from our group there every night enjoying an indian meal and a “Strong Beer”. Trust me, it was strong. 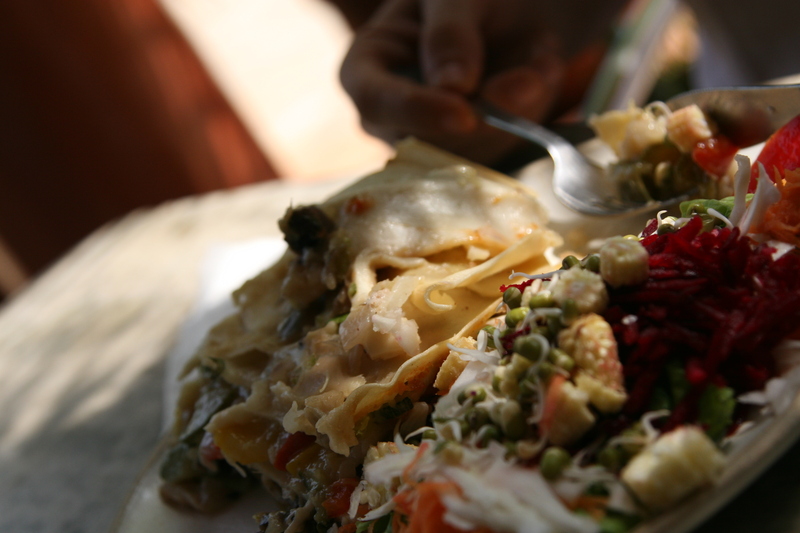 Auroville offers a variety of restaurants. Everywhere you go you are offered very fresh and organic vegetables, making you feel rather healthy after a month. For my part, my favorite restaurant was one Martanda and Catherine took us to on the side of the East Coast Road (ECR). There, we ate street indian food: dosas, idlis, paranthas, and half-boiled eggs. I tried nearly everything on the menu that night and found the half-boiled egg experience rather interesting. The half-boiled is just another name for a fried egg, but there is a special way to eat it. As I observed Martanda chow down his food I wanted to try the half-boiled before I left. At that restaurant, the food was served fast, extremely fast. The quickness of the service unconsciously made us eat quicker and more. The half-boiled egg is the perfect example of this. You are served a fried egg and are supposed to put the whole egg in your mouth, wait for the yoke to burst and then just swallow the entire egg without chewing… After the whole experience, some tobacco pan and nice cup of chai is very much appreciated for the digestion process to begin. Throughout the trip, I found that Pondi street food was the most exciting. You would just stand and wait for sizzling hot, spicy and flavorful food and follow it up with a piping hot chai. However, it is nearly impossible to eat street food and not have stomach ache for a few days, the price you pay for the fun you have… So coming back to Auroville and its organic lifestyle was very soothing, for the stomach and for the soul. 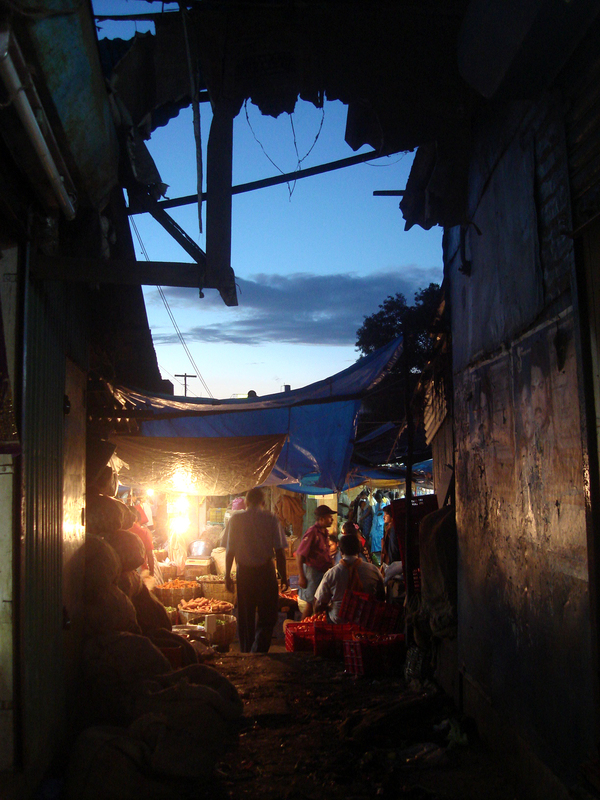 I wandered around through the market at dusk and saw a piece of the sky. The market was bustling, people shoved past me with a variety of things; plastic bags filled with colored powder for Kolam, handfuls of vegetables, flowers, you name it. I lingered in front of this shot for a couple of seconds while tourists haggled for the best prices on fabrics and saris adorned with sequins and beads in a variety of noisy colors. The market was a multi-sensory experience which was a bit overwhelming at times, but a great and lasting memory. Kalsang is one of the Aurovillians that inspired me the most during my stay in Tamil Nadu. Originally from Tibet, her family was targeted by the Chinese government because of their willingness to spread the Tibetan language and culture within Tibet. In order to save his children, Kalsang’s father brought four out of the eight brothers and sisters across to Dharamsala, India. There, they would get a proper education and be able to learn all about the Tibetan culture. The Chinese government killed many Tibetans attempting to maintain a sense of national identity in their own country, including Kalsang’s mother… Living in Dharamsala, Kalsang attended the Tibetan Children’s Village School. At the age of 15, Kalsang went on an exchange program to Auroville. Like many others, she fell in love with the surroundings and started planning her return to the city of Dawn. In 1994, Kalsang packed up her bags and settled in Auroville. Leaving Dharamsala was no easy task and her brothers and sister did not understand her decision. Although it created tensions with her siblings, Kalsang knew that she belonged in Auroville. At first, she thought she was attending an International Institute for the Environment and was surprised not to be taking courses when she moved to Auroville. She quickly discovered that she needed to learn how to ride a bicycle, a motorbike and then find a job. Kalsang has worked for many units in Auroville including the Matrimandir Nasri (rose garden) and has lived in 7 different communities. Over the years, she adapted and integrated the Aurovillian community, which was rather exclusive at the time. From 1995 onwards, Kalsang worked closely with the Tibetan Association Group. She helped frenchman Claude, who is the first contact with Tibetans in Auroville due to his affinity with Tibet and the Tibetan culture, lead workshops and spread Tibetan culture within the Aurovillian community. In 1997, construction for the Tibetan Pavilion started and Kalsang and her partner Namgyal moved into the Pavilion in 2000. The Tibetan Pavilion is build following the Kala Chakra Mandala and embodies Tibetan culture in Auroville. Before construction even started, plans of the building were sent to his Holiness, the Dalai Lama, for approval. Initially, Kalsang planned to place a large statue of Buddha in the atrium, but the Dalai Lama being aware of Auroville’s stance on religion, advised to place a calm and soothing fountain instead. Kalsang has struggled to get to where she is today. By running the Tibetan Pavilion, first pavilion of the International Zone of Auroville, Kalsang vows to modernize and spread the Tibetan culture throughout India and the rest of the world. She says the concept of welcoming anyone who wants to learn about it will never change. Due to her hard work, the Tibetan community has gained a lot of respect in Auroville. In 2003, her daughter Jang Chup was born in Auroville. The more time I spent with the Tibetan family, the more I realized how special this child is. Jang Chup grounds the family and represents the future of Tibetan culture in Auroville. Born in India, she is conscious about being Tibetan. At the age of 6, she talks about freedom, the Chinese violence in her motherland and already speaks english, tibetan, tamoul, hindi, some sanskrit and is learning french. Jang Chup represents the future of the modern tibetan culture. She lives in India, is very aware of the significance of being Tibetan and through her schooling will be able to modernize the Tibetan culture with the new generation of Tibetans living in exile in India. As she says, “Happy to be born in India but proud to be Tibetan”. Kalsang with her daughter Jang Chup. The Dalai Lama has played a huge role in Kalsang’s life. In 2009, his Holiness inaugurated the Tibetan Pavilion in Auroville and met Kalsang for the third time. Kalsang believed that this would be the day she could rest, move on. She had created the pavilion and was now ready to work elsewhere in Auroville. However, the Dalai Lama told her “it is only the beginning of your mission”. Initially surprised, Kalsang now admits she agrees with his Holiness. “I feel it’s true”, says Kalsang. Kalsang is dedicated to spread and participate in the modernization of Tibetan culture. Everyday, she strives towards raising the awareness of the difficulties Tibetans face. One of her current projects is to bring children from the Tibetan Children’s Village School to Auroville every year, entirely funded by the Tibetan Pavilion and alumni. In hopes that Kalsang will inspire the new Tibetan generation as much as she did Jang Chup, I urge anyone who visits Auroville to stop by the Tibetan Pavilion for a chat and and a cup of chai with Kalsang, her partner Namgyal and little daughter Jan Chup. Anyone who does so will be sincerely inspired and moved by Kalsang’s ongoing efforts. Collective Meditation around Atrium Fountain, Tibetan Pavilion. During this awesome month in Auroville, I worked for the internet-based community radio – Auroville radio. This was an amazing experience that I shared with Chloé, a French journalist working there for two years now, and Andrea, the Italian founder of the site. As a former working journalist in written press, I enjoyed the new feeling of having a microphone, interviewing people using sounds and no written words. Discovering the technical aspect of the job in editing was also something very gratifying. I managed to present, with Chloé, the news in French three times, every Thursday and to do a program on Auroville waste management or how Auroville has to change its behaviour toward this issue to ameliorate the situation. Overall, I appreciate the experience more than the words can tell. I learned, I had fun, I meet new, interesting and challenging people, and I am ready to live the whole thing again whenever the occasion comes. 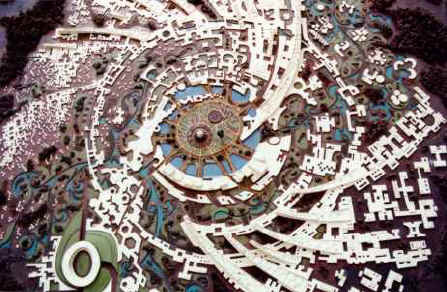 Auroville is something unfinished; maybe this is why we want to go back. Here are the links to listen to the programs I did. Not quite 3 weeks in Auroville… Projects are moving along, routines are beginning to take form, and for me one big thing missing in part of my routine was becoming apparent… volleyball… I had spoken with Martanda about the opportunity for volleyballl and he was like yeah… Many people in the neighboring villages play… Well, I had waited long enough..
“Martanda, I need to play volleyball….” “Where can I play volleyball?” Martanda, has an answer to everything and many times it is the answer you want to hear.. So I get a phone call from the Great Martanda when he tells me that a group will be playing volleyball on Tuesday from 5pm until dark… and that they will be expecting me, and they also play Fridays and sundays. WOOHOO!!!! I was going to be playing volleyball after about 2 weeks…. So Tuesday comes around, I make my way down the dirt path and onto the tar road with big trucks, tractors, other cyclists and cows… towards a village on the outskirts of Auroville… Its about a quarter past five, I make it to the court (partly covered with dirt) neither a sand court, nor concrete court… just a court with a net…. I wait… and wait… and wait… Text Martanda to double check I am at the correct location. Well, I was there, but no one else was… I was rather sad, I was so looking forward to playing… But no luck that day… So a few days pass and we continue with various projects, seminars, and meetings and a really bad case of athlete’s foot had developed on my right foot… It actually hurt to walk… I could not put the ball of my foot or my toes down. But I continued on to meetings, tours etc… Martanda’s first suggestion is amputation… then he reasons with me and says I should try this natural treatment; the leaf of the neem tree…then use tumeric powder as an antiseptic… Well what the HELL!! Its local, Kalsang backed him up.. So I grabbed a handful of leaves from the neem tree by the Tibetan Pavillion, let them soak in boiling water… then I was to soak my foot in it, once the water was a tolerable temperature. I really don’t know whether it was the neem leaves or just the fact that it was extremely hot water that I couldn’t feel my foot anymore… then I mixed tumeric powder with the water and neem leaves… and covered my foot. For the following day or so my foot was yellow…. And the pain was still there. Saturday morning not even out of bed I had the great pleasure of a visit by the Great Martanda… He walks up to my screen window and asks me if its time to amputate… My neighbor did not find that very amusing, and I told Martanda I would not give him the pleasure of amputating my toes… So we instead opted for a trip to the clinic where I did get some treatment on it, betadine and antisceptic cream… it looked pretty bad… I attended that afternoon’s seminar about organic gardening in Auroville… it was more like a recruiting session…. The person who runs the place really was trying to recruit us to come help work from 0630 to 0930 every morning… planting etc… no one was convinced though. Here is where you learn how stubborn I can be… that afternoon, though still in a bit of pain I went to play a game of Ultimate Frisbee with some of the locals… Yes the first few rounds were tough… but after a while the pain in my foot was gone… and I had a great time… I was looking forward to Sunday morning; from what Martanda and Catherine said – Sundays were the days to go and play volleyball… So, I got a good night sleep, and a good breakfast that morning. I get to the grounds about ten minutes past nine… No one around. I wait for a good 20 – 25 minutes, and still nobody. I send Martanda a text… “What is going on… Twice I show up to the courts and there’s no one there…” So I head back to camp… in a very foul mood, might I say… Martanda’s response: “ OUCH getting a taste of India… Welcome, Welcome” because apparently 9 AM India time is anytime from 9 am on… Then around 10:20 I get a phone call from Martanda telling me that they are at the courts… so I give it one last shot… so I show up to the courts and finally get to play a few games (India village style) of volleyball… no real rotation…. Just front row and back row… I of course was asked if I could set.. What is it with guys… always expecting the girl to be the setter… I guess it only proves how men can’t be the decision makers… since as the setter you decide who gets to hit… So I get to be setter… occasionally making a dig and a few attacks… All in all it was a great morning. After the game, Ashok, one of the locals and I start talking about our volleyball obsessed lives and once the word was out that I coached… he brings up that starting monday they were organizing a volleyball camp for the youth of the village and he wanted me to give them various drills and even asked me to come and coach. Monday afternoon, after one of the many seminars I made it back out to the court where its me and about 12 young guys… It was rather interesting… coaching…. With a language barrier (a form of field research). Fortunately when coaching many times you have to demonstrate and body movement is pretty much universal so the translations were quite efficient, and I feel we got a lot done. I had support from some of the guys I had played ball with on Sunday, and we finished practice with a round of “Kings of the Court”. These young guys were very open to learning and we had a lot of fun, so much that they even got me to wake up a 0600 the following morning to come do conditioning with them. Unfortunately with my schedule and various seminars I was unable to make it back. So the week went on, no volleyball from me, so I apologize to all, if I wasn’t the best company to be around…. But volleyball is a form of stress release… Sunday morning again got up had a good breakfast and off I went to volleyball. This time there were about 4 different teams from neighboring villages. Volleyball is quite a popular sport in the villages… there were even some younger kids playing on the badmington court. Today’s games were quite intensive… Ashok, myself and others from Kuilayapam, a neighboring village a several good games, the first one with me at setter, then I moved and played more backrow, just as fun… and way more efficient. 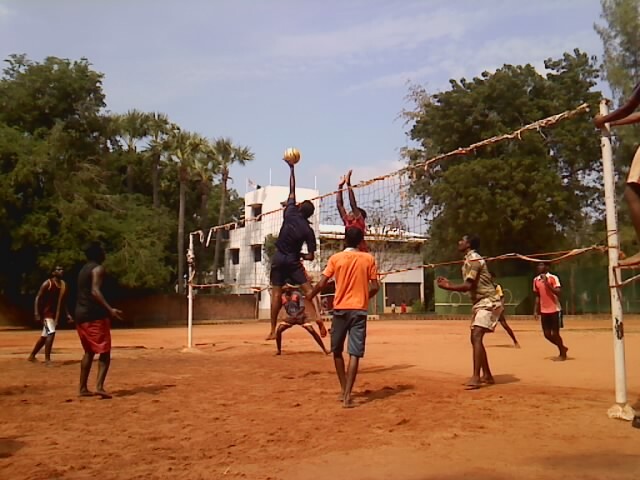 Unfortunately time in Auroville has passed by rather rapidly, and if time permits on Tuesday I will be able to play one last round of volleyball in Auroville, before my return to freezing Paris. this would give us an opportunity to discover a story worth telling. Our intuitions paid off as within the first week, we had come across an extremely inspiring project from a clothing design studio in Auroville called Upasana. (www.upasana.in) We set off to produce a film highlighting Upasana’s Kapas Organic Cotton Project, which was established in 2008. Kapas is designed to encourage people to work collectively towards creating and promoting a socially, environmentally sustainable cotton product. This unique venture aims to produce a completely sustainable product supply chain starting from the seed through to the production of the final product – which we discovered is surprisingly rare in the organic industry. The Kapas project also strives to protect the, often, neglected cotton farmer in India as they have fallen victim in recent years to mass production, globalization, seed modification, debt, and, sadly, a wave of farmer suicides. We believe that this brand’s particular vision for the productive sustainability of the cotton, textile, and garment industry is extremely fascinating as it truly exemplifies a morally, culturally, and socially conscious form of business. Because Kapas is a relatively new venture for Upasana, we hope our video begins to introduce the basic ideas behind Kapas. Furthermore, it could, potentially, bring about a certain sense of clarity and awareness surrounding the organic cotton trade in India, as well as provide an awakening about the enormous human and earthly impact this massive cash crop has had on a developing community and the world. During our filming, we were introduced to such issues such as women’s empowerment, village sustainability, environmental and social awareness, and industry insights. We learned that the organic and fair trade industries in themselves were in much need of improvement. Efforts to label a product organic are extremely expensive and exclusive. While many Indian cotton farmers produce an organic product they do not have the means to afford or attract support from the organic industry, and thus do not receive the organic label. 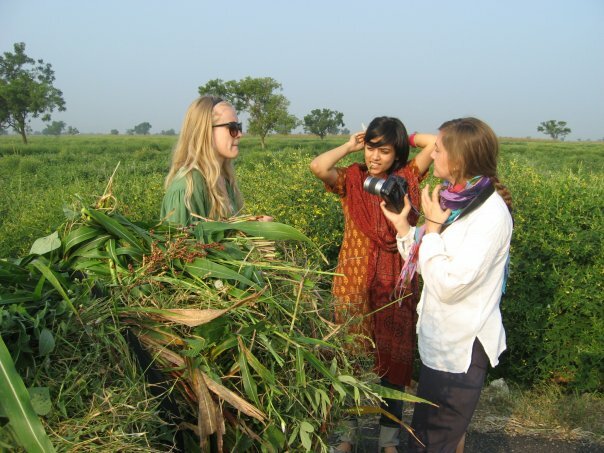 We had the opportunity to travel – on an overnight bus – to Madurai, India to see first-hand the organic cotton fields. We spent two amazing days meeting the farmers, spinners, and weavers of cotton, and we were truly inspired by their passion for their trade as well as their willingness to welcome us into their world. We discussed the extremely harsh realities that these farmers face surrounding poverty and lack of concern from the outside world. We quickly realized that this industry is one that has surely been forgotten in the world’s quest for a more sustainable future. 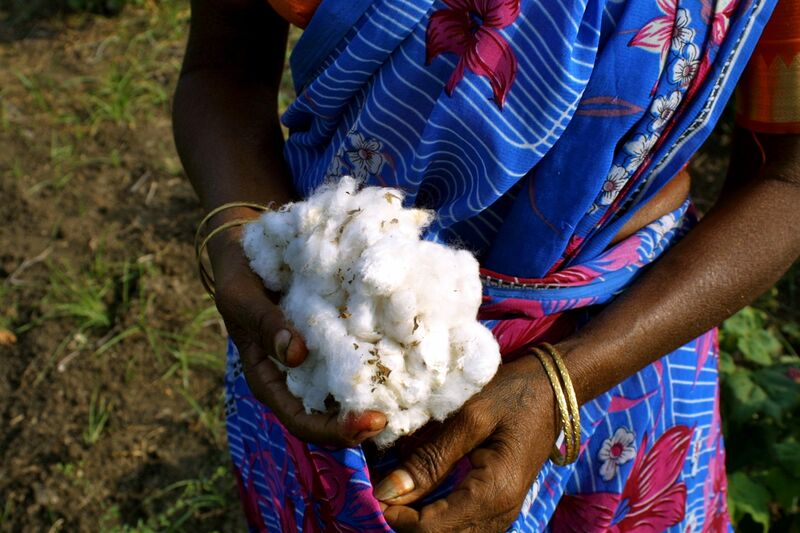 Cotton is Tamil Nadu’s only cash crop and is one of the largest cash crops in the world. Billions of dollars flow through the cotton trade every year, and the reality is that the social and environmental cost is extremely high as mass production has taken over much of the industry. While the oil and food industries, among many others, have been attacked for their contribution to the issues surrounding globalization, we found that the cotton industry is no different and, thus, should not be overlooked. We discovered that we can no longer sustain a world where cheaply-made clothing items are worn once and thrown out and vanity overshadows the health and future of our planet and its people. During our filming, we were worried that the farmers, who were demonstrating their farming techniques, were wasting their resources and hard-earned money. They responded by assuring us that more than anything they wish to have their story told because they do not have the power nor the means to do so themselves. In that moment, we realized that the power of our video camera and easy access to Internet was one thing that should never be taken granted. We will never forget our time discovering this beautiful story, and the people who helped us along the way. As cliché as it might sound, we are forever changed by our journey. We feel much in debt to those who have given us this opportunity and hope that our final video project will bring about a sense of awareness to the cause as well as some insight into one of the world’s most beautiful yet forgotten people. Notice something? Yes, it is meant to look like a galaxy. This has been done so that all the zones spiral out from the centre, the city becoming a representation of the Human Unity. This means that the roads all have a circular nature to them, and there are hardly any straight lines. In Paris I live in the 15th arrondissment, and while I know the other parts of the city are hard to navigate, in the 15th it took me almost two months before I really figured out how to go anywhere in my neighborhood without going ten minutes out of my way. This is because all the streets are on angles, making weird sections like triangles. I know this was done in Paris in order to protect the city from invading troops. A friend in Paris also told me once that it was done for protests too, I haven’t checked that, but it makes sense. Armies or Protestors, the city of Paris is built so that the major thoroughfares can be blocked off and force invading troops into the small streets, where, like me, they will get hopelessly lost. Here in Auroville something is eerily familiar. While Auroville may talk about human unity the very town plan paints a clear line between visitors and residents; those that know their way around the confusing maze and those that don’t. It is a city plan similar to those used to protect from war and strife, not peace. I’m not a city planner, and I don’t particularly like the way that North American cities are designed, but one thing is true, the grid design makes it easy for people to get in and out easily. I recently learned that suburbs in Toronto, were I grew up, were built in circles, which were supposed to form little communities around cul-de-sacs, this in fact made it very difficult for the housewives living in these neighborhoods to leave their communities without a car. Cabbage Town, a different part of Toronto, was built in a grid. This was purposely done so that the poor people who lived there could get to work and back easily by bus. Grid designs make it easy to use public transport, grid systems are easy to navigate, a city designed in a grid is accessible. Auroville is not accessible. For all the talk about representing Human Unity here, the city itself seems to say, your not from here, and so we’re going to make your life difficult.